Zane Grey, who wrote a lot of western literature and eventually sold over 40 million books was originally told ‘You have no business being a writer and should give up.’ He ended up writing about 90 novels about a quarter of which were made into films. Read the full post from Erica Verillo. 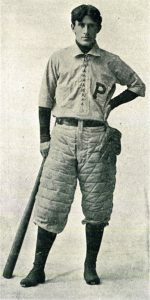 Zane Gray was a member of Penn’s varsity baseball team in 1895 and 1896 and the picture is of him there.